Everyone has their weaknesses, and mine is for pinnys - I fall in love with almost every pinny I see, and spend far too much time (when I should be working) scouring the internet and shops for new additions to my collection. So, instead of spending the money I should be saving for a house deposit on pinnys, I will be taking the time to search for my absolute favourites, and limiting my purchases to the real crème de la crème of pinnys! To help me decide I will post my favourite ones from each month on here in my 'pinny of the month' feature. Can't wait! I might even show you some of my homemade pinny creations throughout the months. To start us off, here's my first one from Anthropologie. 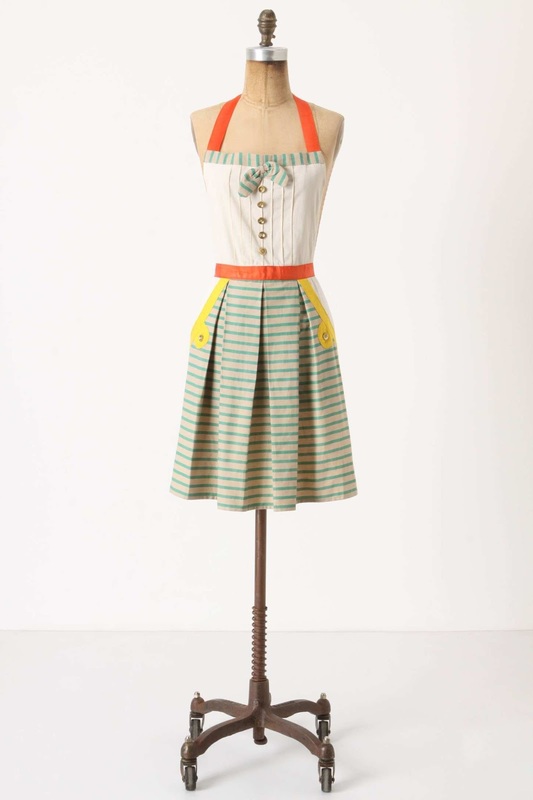 I love how Anthropologie make their pinnys look like old fashioned style dresses. I love this one because it's so colourful, and the pleats make it that bit more special. PLUS it comes in a kids version too...get them started early :) Ahhhh I might have to purchase it (bye bye house deposit fund).